Last Updated: March 19, 2019 · Published: May 30, 2017 By: Asian Caucasian Leave a Comment This post may contain affiliate links or sponsored content. In honor of National Donut Day (June 1st), we’ve created these gorgeous sushi donuts that look like a work of art! But, shhhhh, they’re so easy to make! Who doesn’t love donuts? These trendy donuts are so fun to make and are, of course, healthier than the sweet variety. Start by using a donut mold. We like this silicone mold because of its flexibility. You can be creative here — layer the bottom with your favorite sushi-grade fish (tuna and salmon) and veggies like thinly sliced cucumbers and radishes, or add in layers of avocado. Next, choose some pops of color with red salmon roe (fish eggs) and black & white sesame seeds. Top it all off with sushi rice (prepared in a rice cooker), flip it over, and voilà, a perfect sushi donut! Best of all, you can easily find sushi-grade tuna at select grocery stores like Whole Foods. If you’re skittish when it comes to using sushi, make your donuts with cooked fish, or go vegetarian! The possibilities are endless. 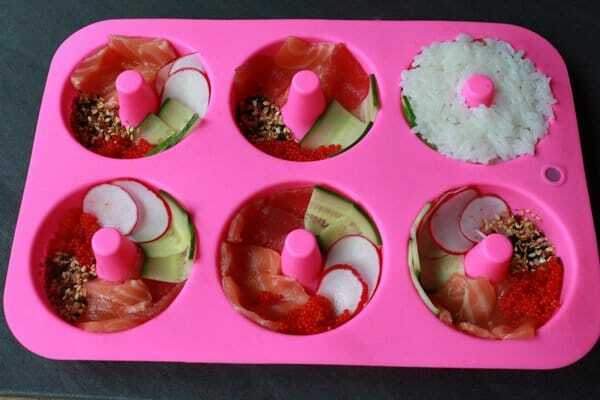 This awesome silicone donut tray is perfect for creating sushi donuts! Create your filling for sushi donuts by layering at the bottom of the donut tray using sushi-grade fish and your favorite sushi veggies like thinly sliced cucumbers and radishes! Sushi-grade salmon and tuna can be found at select grocery stores like Whole Foods. 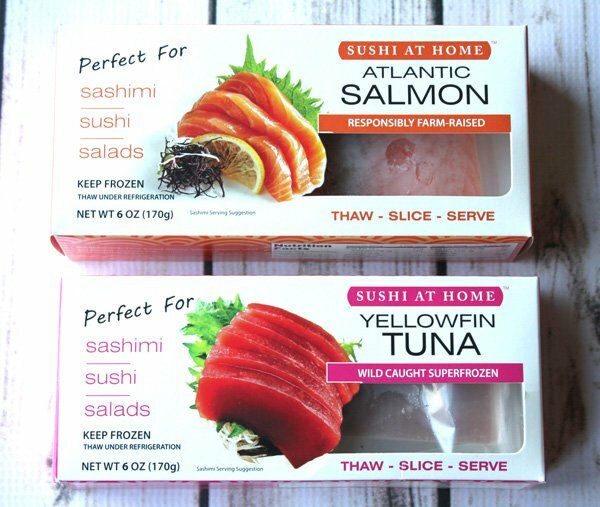 They now carry “Sushi at Home” frozen sushi fish. Defrosts very quickly! 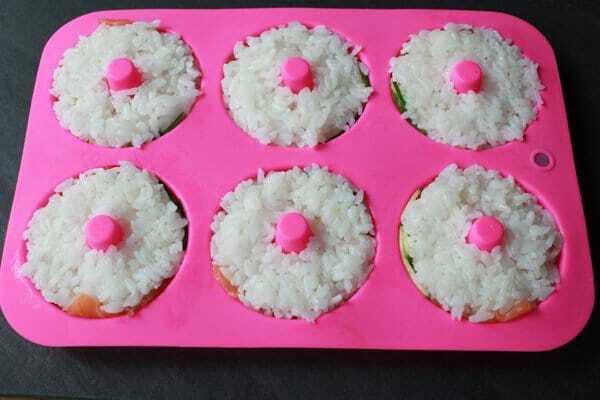 Fill the tops of the donut trays with sushi rice. Then flip them over for a perfect sushi donut! Prepare the toppings: Slice the tuna and salmon very thinly on the bias, with pieces about 2 inches long. Slice the cucumber in half and again in half length wise. Using a mandolin on a very thin setting, slice the cucumbers into spears, lengthwise. Cut them into 2 inch pieces. Slice the radishes on the mandolin. To make the donuts: Working around the donut mold in batches, press the fish into the bottom of the donut mold, then the cucumbers, then the radishes, then spoon in the salmon roe, and sprinkle in the sesame seeds. Repeat with each mold. You can mix up the order! Finally, press in the rice on top of the other ingredients, making the top of the rice as flat as possible. Place the mold in the refrigerator for at least 5 minutes. Remove from the refrigerator and place a flat plate or tray on top of the mold and flip over the mold. Carefully remove the mold from the donuts making sure that none of the ingredients are still inside the mold. Top the donuts with slices of chives and serve with soy sauce or Ponzu sauce, pickled ginger, and wasabi paste.